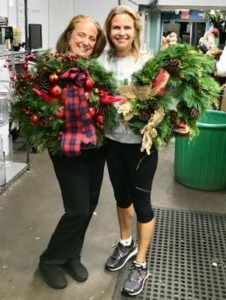 Membe rs of the Junior League of Greenwich (JLG) gathered this week at McArdle’s Florist and Garden Center for a wreath making workshop. All wreaths created at this workshop will be for sale at this year’s The Enchanted Forest, to be held at Christ Church Greenwich on Thursday, November 16 to Saturday, November 18. 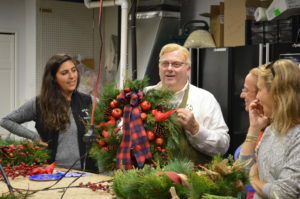 Leading the workshop was George Von tobel of McArdle’s, a Greenwich resident of 55 years. Mr. Von tobel began the workshop explaining to JLG members how much of an impact the Junior League has had on his life. George told workshop attendees that the Junior League’s impact on him began at an early age when he attended Pre-K at Hamilton Avenue School. The Pre-Kindergarten Project is a former Junior League of Greenwich project that ran from 1966-1972 and was located at Hamilton Avenue School. The program served four year-olds referred by the Housing Authority, Social Services Department, and other town organizations. It provided the educational and creative stimulation that many children lacked at home. The Board of Education took over this highly successful program in 1972. 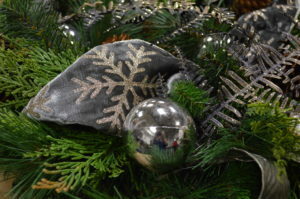 George ’s love for working with flowers bloomed with his involvement in the Festival of Trees (now The Enchanted Forest) when it was held at St. Catherine of Siena Church. His family donated a tree every year as did several flower shops he worked with. Mr. Von tobel later decorated the tents for the Cotillion from his store “Flowers by George” for many years. George recalled how exciting it was to see one of his Pre-Kindergarten teachers, Junior League Member Barbara King, at Cotillion! 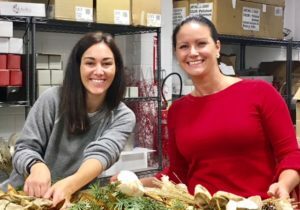 Wreaths made during the workshop at McArdle’s Florist and Garden Center will be available for purchase at The Enchanted Forest from Thursday, November 16th to Saturday, November 18th at Christ Church Greenwich. The event is moving “Home for the Holidays” across from JLG Headquarters, and all of the traditional activities the town has come to cherish including gingerbread workshops, photos with Santa, Santa’s breakfast, a Polar Express-themed lunch, and more children’s entertainment are moving as well. The Enchanted Forest draws thousands of visitors each year from Greenwich and the surrounding communities. A variety of festive events are scheduled to take place during the three-day celebration. Other features and highlights occurring throughout the weekend include The Children’s Giving Shop, music performances, food trucks, and much more! Funds raised from The Enchanted Forest go directly toward supporting impactful community projects identified, designed, and implemented by the Junior League of Greenwich. General admission tickets to The Enchanted Forest on Friday and Saturday start at $10 per person. “Thursday Night Sneak Peek” tickets are $30. Prices vary for other activities. To plan your visit and to purchase tickets, visit The Enchanted Forest website: www.501auctions.com/jlg.